It is no surprise that drugs have become a serious problem for communities across America and New Hampshire is no exception. Fortunately, there is much that can be done to combat the use and sales of illegal narcotics. An unusually large amount of traffic contacting a building -- cars, taxis, or people walking -- often at strange hours. Visitors may sometimes pound on doors or shout to be let in. This traffic is usually quick with people staying only a short time. Sometimes they don't go in at all; instead, someone comes out to meet them. Offers to sell you drugs, or conversations about drugs that you overhear. Noxious odors from or around the buildings, such as "musty" smells. Buildings where extreme security measures seem to be taken. Buildings where no owner or primary renter is apparent, and no home activities, yard work, painting/maintenance, etc., seem to go on. Do not assume the police already know, or that a neighbor will call. Do not assume one report is all that is needed. If the activity keeps on occurring, keep on reporting it. If the pattern changes, report that change. All neighbors affected by the drug activity are encouraged to report. For drug activity which is in progress or needs an immediate police response, call 9-1-1. There are several ways to report narcotics activity in your neighborhood. 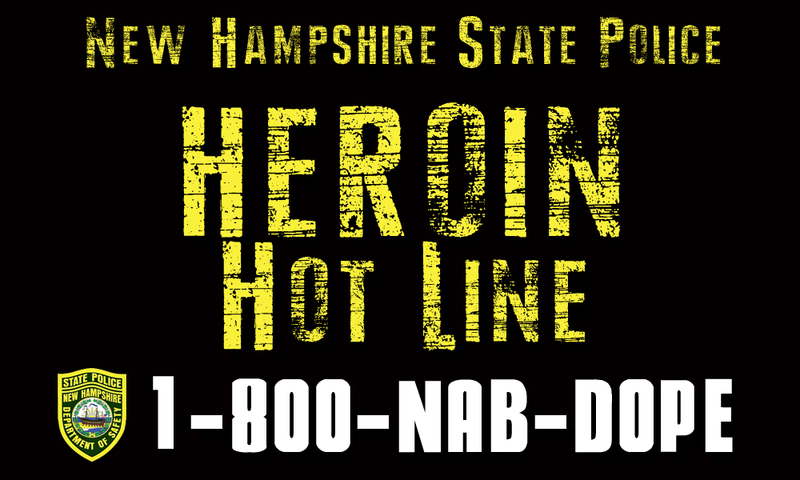 The New Hampshire State Police provides an anonymous tip line to report narcotics activity, 1-800-NAB-DOPE or (603) 223-3860. These complaints are then routed to Narcotics Intelligence Unit, where they are assigned to the field for investigation. Q: Can I Report Drug Activity Anonymously? A: Narcotics activity may be reported anonymously. Q: What Specific Information Should I Obtain Before Calling the Police? A: The information below will give you an idea of the information that will assist us in conducting our narcotics investigation. Obviously, some of this information will not be known to the complainant. Investigating officers will still conduct an investigation, even if some of this information is not known. We Don't Have To Know Who You Are... To Know Who They Are!